Polish rabbi and statesman; born in Szezekoeiny about 1800; died in Warsaw March 17, 1870. He was a scion of one of the oldest families in Cracow, and was brought up in Kamenetz, Podolia, where his father (d. 1832) was rabbi. After marrying the daughter of the wealthy Solomon Bornstein of Wielicka, he settled as a banker in Cracow, of which city he became rabbi in 1832. He occupied the rabbinate for nearly a quarter of a century, but was not recognized by the entire community, a considerable part of which adhered to his opponent, R. Saul Landau. Meisels always took a conspicuous part in the civic life of his place of residence; and in the stormy times of 1846 he was chosen one of the twelve senators of Cracow. In 1848 he was elected, with the aid of Catholic votes, to represent the city in the provisional Austrian Reichsrath, meeting at Kremsier. He took his seat among the radicals, and when the president expressed his surprise at seeing a rabbi seated on the "left," Meisels gave the reply: "Juden haben keine Rechte" (Jews have no right!). In 1856 Meisels became rabbi of Warsaw, where he soon gained the respect and confidence of the entire population. In 1861, during the riots and excesses which preceded the outbreak of the second Polish insurrection, he did everything in his power to induce the Jews to sympathize with the cause of Poland. He accompanied the Archbishop of Warsaw to the funeral of the victims of the first outbreak and marched together with Father Wyszynski at the head of a delegation to the city hall. Later he was appointed by the Russian vice-regent a member of the provisional municipal council of Warsaw; but he remained loyal to the cause of the Polish patriots, thereby, it is believed, preventing massacres of Jews which some Polish leaders had planned and which the Russian government was not anxious to avert ("Allg. Zeit. des Jud." 1861, p. 227). Late in 1861 Meisels, together with Dr. M. Jastrow, was arrested and thrown into prison; after several months' confinement both were expelled from the country. Meisels was invited to settle in London; but in 1862 he was permitted to return to Warsaw, where he remained until his death. 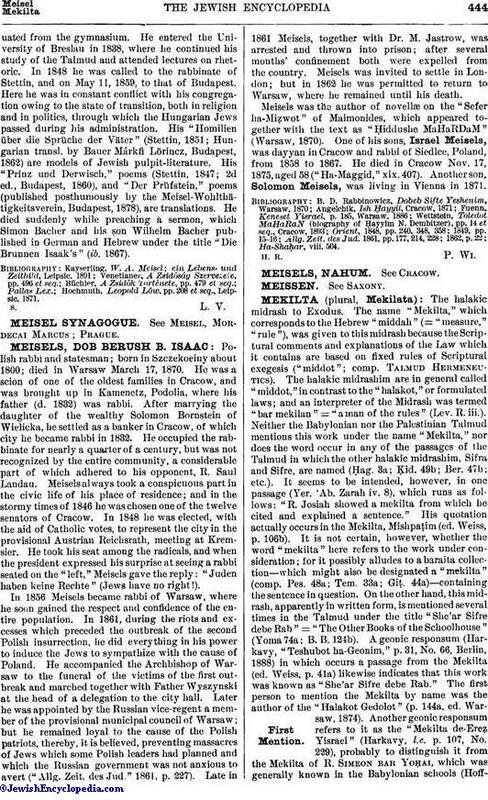 Meisels was the author of novellæ on the "Sefer ha-Miẓwot" of Maimonides, which appeared together with the text as "Ḥiddushe MaHaRDaM" (Warsaw, 1870). One of his sons, Israel Meisels, was dayyan in Cracow and rabbi of Siedlce, Poland, from 1858 to 1867. He died in Cracow Nov. 17, 1875, aged 58 ("Ha-Maggid," xix. 407). Another son, Solomon Meisels, was living in Vienna in 1871.